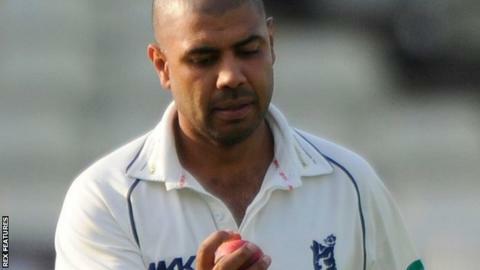 Warwickshire off spinner Jeetan Patel starred again at Edgbaston as he took 4-58 to help bowl out Surrey for 252. Backed by 3-46 from in-form ex-Surrey all-rounder Rikki Clarke, Patel took his season's haul of first-class wickets against Surrey to 14. Surrey looked in control at 110-1 midway through the second session. But Patel claimed the wickets of Rory Burns (50) and Kumar Sangakkara (47) as Surrey folded to 252 all out, bad light preventing the Bears from replying. Patel took 10-123, the best match analysis of his first-class career, when the Bears beat Surrey by 10 wickets inside three days at Guildford in July. Surrey are without Ben Foakes (quad strain), rested as a precaution ahead of next Thursday's One-Day Cup quarter-final at Northampton, while Warwickshire made two changes,. They brought back formert captain Ian Westwood for the out-of-form Andy Umeed, while Laurie Evans was also recalled from his loan spell with Northamptonshire to replace Sam Hain (shoulder injury). "To be honest, I didn't think we got absolutely everything we deserved. In the morning the guys were outstanding and only got the one wicket but at the end of the day to bowl them out for 252 was a really good effort. "It's a good wicket with a bit of pace and good carry and a bit in it for everyone. The bowlers did really well to keep them down to around two an over, especially with such a small boundary on one side. Jeetan and Rikki were the stand-outs but the bowlers collectively were very good. "With regard to tosses, I've given up on them! Hopefully it will change at some point but it's certainly not helping us. I'll have to work on the technique over the winter and see if I can come back a bit better next season." "They were tough batting conditions. It seamed all day and it's quite tufty sort of grass, so it helped the spinner and the ball swung for them as well. "I don't think we ever really felt in in any part of that innings but we have got to try to make 252 look as good as it can be. Hopefully conditions won't change too much. It might be a good score, you never know. "Warwickshire's bowlers have pretty much given us the blueprint there. You've got to stay disciplined and hold your length and make batters come to you because there is so much assistance in the pitch."